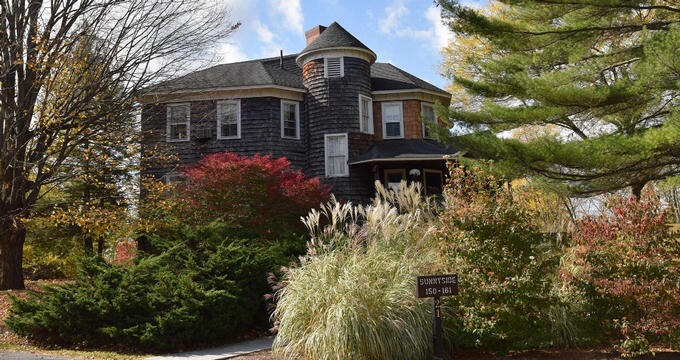 The Interlaken Inn, located in Lakeville, Connecticut, sits on 30 acres of land that includes wooded areas and manicured gardens. It was recently awarded the honor of being one of the Top Twenty New and Renewed Hotels, Inns, and Bed and Breakfasts in the Northeast. It offers a variety of secluded rooms and cottages, a full-service spa, dining options, and many different outdoor activities for inn guests to enjoy. The Inn is open all year round. The lodging at Interlaken Inn comes in the form of guest rooms, suites, houses, and cottages. Each area is best for a specific type of inn guest - single people, families, couples, family reunions, etc. The Main Building has 40 guest rooms available for rent. The first-floor rooms (roughly half of the rooms available) have two queen-sized beds. Two of these rooms have been deemed handicapped accessible. The first floor also has ramp access. These rooms also come with private baths, an outdoor walk out balcony, and heating and air-conditioned that are individually controlled. The second-floor rooms allow guests a choice between either a king-sized bed or two queen beds. The second-floor ceilings are vaulted, and the attached, private bathrooms have marble counters and sandstone showers. Guests can choose from poolside, golf course, or parking lot views. For Interlaken Inn guests looking to rent a suite for their stay at Interlaken, there are multiple options as well. The Penthouse Suite is the most upscale suite at the Inn. It is located on the second floor off The Main Lodge and has its own 50-inch flat screen television, a private rooftop garden and patio with a hot tub accessible through french doors, a linear fireplace, a king-sized bed, and a private bathroom with both a granite shower and a soaking tub and his and hers granite sinks. There is also the Woodside Suite, which has its private entrance. The suite has a large sitting area, two 25-inch flat screen televisions with DVD player, a refrigerator and microwave, and a king-sized bed. The private bathroom is oversized and crafted out of granite, with two different shower heads. French doors lead Inn guests out to their private patio that has a hot tub. This suite is often called the Honeymoon Suite. The last option is the Townhouse Suites, also known as the Family Suites. Each suite is two bedrooms. One of the bedrooms is a loft with either a king-sized bed or two queen-sized beds, and the other bedroom has two queen sized beds. The suites feature a separate living room with a fireplace and a sleeper sofa (queen sized) as well as a separate dining area. The suite also has a fully equipped kitchen that provides stainless steel appliances and private laundry facilities. Each Townhouse Suite has two and a half baths, as well as an outside deck that faces the swimming pool and Inn courtyard. There are three houses to choose from that are available for rent - the Countryside House, the Sunnyside House, and the Woodside House. The Countryside House is the original innkeeper at Intaken’s former home. It is an English Tudor that has eight bedrooms with king-sized beds, which can be rented out individually as rooms or by renting the entire house. The house is walking distance from the Main Building and most of the on-site features. The Sunnyside House is a classic Victorian home originally built in the 1800s. The house functions as Interlaken’s bed and breakfast and has a wraparound porch with comfortable Adirondack chairs, a lobby with a winding staircase, and a large, private backyard for inn guests’ use. There are twelve bedrooms at Sunnyside - nine of them with king sized beds, one with a queen-sized bed, an additional king-sized bedroom that is considered pet-friendly, and a suite with a king-sized bed, sitting room, and private bathroom. Finally, the Woodside House features eight all pet-friendly rooms with private baths, vaulted ceilings, queen sized beds, and sleeper sofas. The building is all one level, making for easier access for disabled guests. The last available option at Interlaken Inn is the cottages. There are two available onsite - Basha and Lakeside. The Basha cottage was recently renovated. It offers two bedrooms (both with king sized beds), two full bathrooms, a separate living room with a fireplace, and a deckside hot tub that fits four. It is perfect for either two couples or a family. There is a fully equipped kitchen with stainless steel appliances. The lakeside cottage is the most secluded of all the available properties at Interlaken. It is smaller but has a master bedroom with a king-sized bed, a separate living room with a sleeper sofa, a smaller kitchenette with a microwave and refrigerator, a screened in porch, and a fire pit at the edge of the lake. The cottage also comes with a canoe for private use. All the guest’s rooms in the Main building have flat screen televisions that offer digital cable, high speed complimentary wireless internet access, hair dryers, and coffee makers. The second floor of the Main Building offers additional amenities that include a refrigerator, lighted makeup/shaving mirrors, and a safe. The suites also have flat screen televisions, fully equipped kitchens with refrigerators, and complimentary wireless internet access. The rooms in the houses and cottages also offer flat-screen TVs with digital cable, high-speed complimentary internet access, and coffee makers. Only the Lakeside cabin features daily housekeeping services and DirecTV via satellite. The Inn provides a complimentary continental breakfast in the mornings as well. The Interlaken Inn has a heated, outdoor pool that is seasonally available (from Memorial Day weekend until Labor Day weekend). Guests can also swim in the attached lake, Lake Wononscopomuc, as well as rent a canoe or kayak free of charge. There are two outdoor tennis courts at the Inn, as well as an executive short game golf practice facility and challenging nine-hole golf course. Indoors, the Inn offers a game room with ping pong, pool, air hockey, and card and game tables. Guests may also enjoy the half basketball court or the volleyball net. For guests wanting something more relaxing, there are meticulously maintained sculpture gardens located onsite. Guests can stroll through them, as well as around the 30 acres that make up the grounds. The surrounding area outside of Interlaken Inn is also full of outdoor activities, including horseback riding, hiking and biking trails, the Catamount Adventure and Lime Rock Park, the Skip Barber Racing School, local vineyard tours and tastings, and antique shops. The Ellora Spa, located on the premises at Interlaken, offers a variety of spa services as well as Pilates and yoga classes. The staff also performs massage in inn guest’s room on demand (lasting either 60 or 90 minutes). Reservations for all services are strongly recommended. The spa is closed on Mondays and Tuesdays, as well as all major holidays. Services include different varieties of massage - Swedish, Abhyanga (a specialized massage that originates in India), sage and hot towel, sports, neck, back, and shoulder, deep tissue, ancient stone, Ellora’s unique Rose Otto and couples’ massages. There are also other spa services offered there, including Hawaiian Lomi Lomi, hand and foot, and hair and scalp treatments. They also offer facials. Pilates and yoga classes are offered and can be taken as a group or as a private lesson. The cost includes all equipment, including a Pilates Reformer. A trained instructor teaches them. In addition to the Pilates and yoga classes offered by the spa, there is also a health and fitness center onsite. It has exercise bikes, treadmills, free weights, stair climbers, and other fitness equipment. There is a full-service restaurant available at Interlaken Inn - Morgan’s. Morgan’s focuses strongly on fresh, local, mostly farm to table new American offerings for breakfast, lunch, and dinner. The menu changes seasonally, and reservations are strongly recommended due to the restaurant’s popularity not only at the Inn but also in the surrounding community. Some of the more popular menu items include New England clam and corn chowder, the Morgan’s burger (made with ground short rib and brisket and served with tomato bacon jam, cheddar, and greens on a multigrain bun), and fish and chips. Morgan’s also provides the complimentary continental breakfast offered daily. The staff at Morgan’s operates a private dining club as well as private banquets and parties with notice. This includes Interlaken Guests as well as guests from the local area, so reservations in advance are required.